During the initial mission preparation phase, targeting information would be provided to or by the operator in the form of headings, geo location reference, or landmark information. The information would be provided by direct observers, the operator himself, or sensors in the operator’s network separate from LMAMS. Once positive identification of the target is obtained, the operator would perform mission preparation with the operator control unit, allowing autonomous flight to the area of interest. LMAMS would be capable of loitering once the fly out phase was accomplished. In the terminal engagement phase, LMAMS would have the ability to automatically track a target designated by the operator or allow the operator to manually control the system as needed to focus on a specific area or point of interest. The notional LMAMS flight endurance envelope includes a 15-30 minute flight time and 5-10 kilometer range. 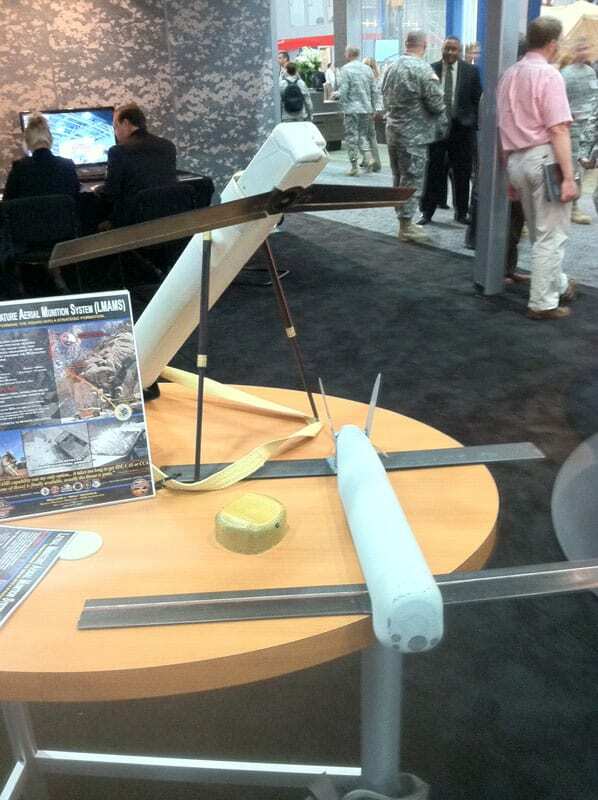 In parallel with the Army’s interest in LMAMS, the Aviation and Missile Research, Development, and Engineering Center (AMRDEC) is also developing supporting component technologies under the Small Organic Precision Munition (SOPM) Program. Electronic Safe and Arm Device (ESAD). A technology readiness level of 7 or higher is desired in the FY14-16 timeframe. Lancer, Sa-25 B Two Iglas mounted on top of each other, in essence. The lower launch tube has a rocket engine/steering system in it, the upper another with a seperating kinetic warhead/loitering vehicle/guidence syatem. The two tubes can be carried individually, along with the mount and sight. Upon deployment the lower tube is attached to the mount, the top one to the lower and the mount “want pictures” You then shoulder launch the missile, which upon firing, the top fires first and the bottom with a slight delay, via gas. The top half of the missile then slows and the lower slots into it’s rear “via a detaching socket aliging mount” it locks in, and the now long missile goes straight up, telescoping to make it shorter as the solid fuel engine burns out via a spring which pulls it towards the war head section for a better flight or something. The engines upon burn out get to about 25,000ft then the attack vehicle seperates attached to a folded up helium balloon and a self inflating gas canister. This then carries the vehicle and three detachable triangulation pods to about 60’000ft attached to a detachable fold out glider wing system. The vehicles warhead consists of a 1kg tungsten dart and/or D.U with foward air intakes which act upon a rear propeller and a ball shaped internal air displacement thrust nozzle for steering. Upon maximum altitude the balloon detaches and the wings fold out attached to the warhead/targeting pods. The projectile then loiters via the glider wings in a large circle steered by moveable wings, can’t remember the term in a predetermined position over the battlefields grid squares determined upon firing, untill it recieves a deployment signal via a radio or something etc. The targeting beacons then blow off the warhead and fall to earth the warhead then triangulates it’s position from these and the initial reading as they fall in seperating manner by design to cover a grid square. The wings then detach upon the triangulation info being recieved and the projectile falls the air acts upon the propeller via the vents and the ball is moved via vents opening and closing around itn and so steered by the air in relation to the info. It then smacks into the target the dart from 60’000 an odd ft with acceleration via the above. Or similar, we already have gps 155mm guided shells apparently so use them etc or whatever the point is something you can fire on the ground and call upon when you need it, it will just circle by software etc untill the command is recieved. However you do it, it’s worth doing.